If I asked what colours one would typically associate with the Arctic, most would probably say brilliant whites or blue reflections against sea ice. Arctic summers however reveal a much broader spectrum, ranging from hues of reds and pinks to greens, yellows, browns and many other unexpected colours. The ice starts to melt and life springs into action again. The ‘Arctic’ ring series is inspired by my interest in the unique qualities of semi-translucent diamonds, with their range of subtle colours and clarities. I've not been to the Arctic region myself but imagery I have seen of seasonal, frozen landscapes, remind me of these pastel ‘icey’ diamonds and the softness of colour that one might encounter during a summer Arctic ice melt. 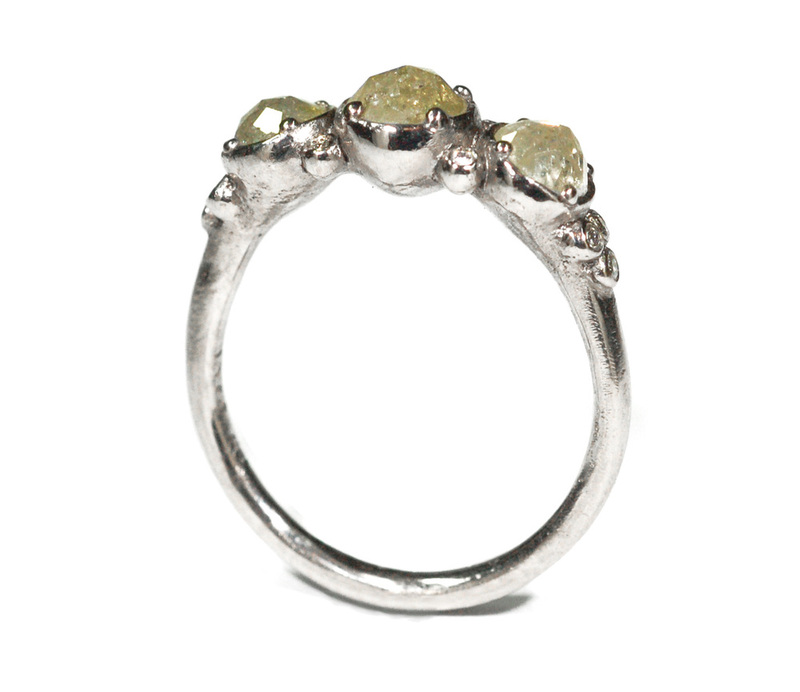 The 'Arctic Summer' ring, pictured above, is 18ct white gold and set with 1.30ct (C.T.W) of rose cut diamonds. It is accented with 10 round brilliant cut white diamonds. It's available at the online store and also through Pieces of Eight Gallery in Melbourne. Crafted in white gold, yellow gold, pink gold and platinum, the 'Arctic' ring series can be designed with your choice of precious metal and coloured diamonds. Enquiries and consultations are welcome and contact can be made via the enquiry page or by phone. All diamonds sourced are 100% natural, conflict free and purchased through the most reputable suppliers here and overseas. Gaston Lacombe’s photography captures these Arctic landscapes beautifully with a great accompanying article, ‘The stunning, unexpected colours of Antarctica and its penguins’, by Pete Brook.